In this day and age, when everyone’s striving towards constant self-improvement, cosmetic surgery has earned the title of a billion-dollar industry. According to the most recent statistics, the number of procedures has risen by 115% since the beginning of the new millennium. The term plastic surgery did seem to be synonymous with facelifts, but it’s high time we acknowledged that, with time, trends have drastically changed. Although the traditional facial procedures and breast augmentation are still one of the most popular ones, we are seeing the diversity in the body areas patients are looking to improve. 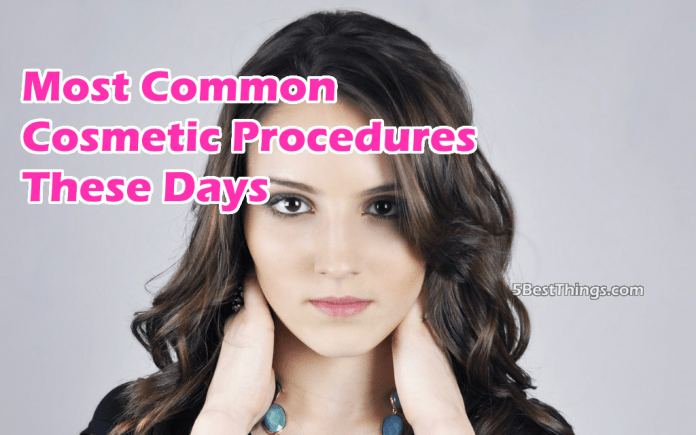 In the following article, we will list 5 procedures that proved to be the most common ones among the present-day patients. What many emphasize as the most prominent benefit of cosmetic surgery is its ability to boost one’s self-image, ultimately having positive impact on a person’s mental health. There are also various researches proving that there is a correlation between gong under knife to improve appearance and our emotional state. With age come wrinkles; our skin tends to sag and, as a result, we see creases appearing below the lower lids. Furthermore, fat may become displaced and in combination with a loss of muscle tone, we notice excess skin under our chin. With facelift, a patient gets a smoother and much more youthful face. Starting behind the ear, a surgeon removes the excess skin and starts working with deeper skin layers and muscle in order to tighten the face. Although facelift has been one of the most popular cosmetic procedures for years (we can almost say decades), with injectable fillers, Botox, laser therapies and radiofrequency tightening, we are yet to see whether it will remain as popular as it is today. Next to facelift, breast augmentation represents one of the most sought for procedures, and the reasons behind so many women choosing to enhance their breast are numerous. The most common ones include their desire to increase their volume after significant weight loss, or sometimes after pregnancy. Aside from the augmentation, breast lift, reconstruction and reduction are fairly popular, as well. During this procedure, the surgeon makes a cut in the armpit, areola, or lower breast fold, in order to insert silicone gel implants or saline. The recovery is relatively fast, but before making a final decision, one should know that the procedure will keep them in bed for a couple of days and they will not be able to bathe up to a week. Finally, the patient is advised not to exercise for two to three weeks. People who feel like they have weak cheek structure usually choose to contour their face with implants. The loss of definition commonly occurs with age, and cheek implants Sydney experts emphasize how cheek augmentation can contribute to a visual rejuvenation of a patient’s face. What makes this cosmetic procedure so widespread is the fact that it is extremely simple, relatively cheap and comes with almost no risk of infection. By making a small incision in the mouth and lower eyelids, the surgeon places implants in “small pockets” which form in the cheek tissue. This type of procedure is followed by a short recovery period, since the doctor removes the stitches after about ten days, or they simply dissolve inside the mouth. Regardless of the number of crunches and leg lifts a person does, sometimes, the belly fat just won’t go away. There are certain trouble areas on our body no amount of exercise can get into shape, and so we opt for liposuction. Whether you decide to tighten your arms, hips, thighs, chin or back, the process is fairly similar: the surgeon makes small incisions in the skin and by using a small cannula, they vacuum or dislodge the excess fat. The recovery period is fairly short, however, results will not be as apparent the first few days after the procedure, as patients have to wait for the swelling to go away. Nevertheless, it’s important to note that the liposuction is not a permanent solution, because those who consider themselves slightly overweight will have to maintain an exercise regimen and adjust their diet in order to maintain the post-op figure. Simply known as a nose job, rhynoplasty made its way to the top 5 most wanted cosmetic surgeries. According to the research conducted by WebMD, it represents the most common cosmetic procedures among teenagers and young adults. There are numerous types of corrections in relation to rhynoplasty – bump removal, bridge straightening, tip reshape, etc. The procedure itself is not considered to be complicated, but a chosen surgeon is obliged to warn their patients of possible issues and complications that might come with rhynoplasty. A group of researchers who published a study on Plastic and Reconstructive Surgery discovered that around third of patients suffer from a Body Dysmographic Disorder after a nose job, what only emphasizes the importance of consultation prior to the surgery. Furthermore, it’s advisable for teenagers to put the surgery on hold at least until the age of 16, in order to allow their facial features to fully mature. Whichever of the above mentioned procedures a person opts for, there are several things that have to be taken into consideration, and a few steps which must not be skipped. First off, the patient should carefully consider reasons for choosing the particular procedure, and that is why expert consult prior to making a final decision is highly recommended. Secondly, they should familiarize themselves with the possible risks and, finally, ensure they are prepared for what awaits them during the recovery period. Certain cosmetic procedures are considered to be simple ones, but they should in no way be taken lightly by the patient who undergoes them.